This amazing analog chorus/vibrato will rule your pedalboard. 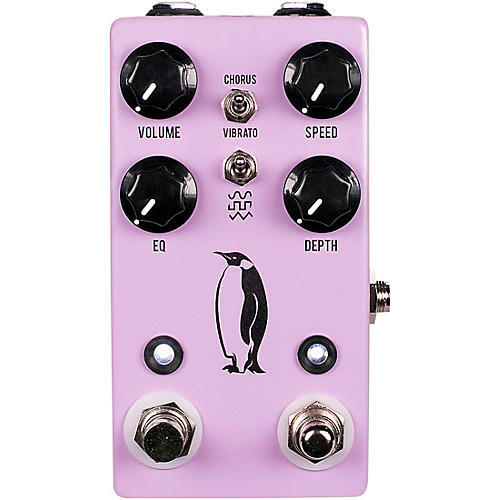 There are two ways to look at the JHS Pedals Emperor Analog Chorus/Vibrato pedal. The Emperor V2 is a vintage-correct effect that absolutely nails the hard-to-find sound of the Arion SCH-1, but it's also a do-it-all modulation solution whether you want a subtle sheen, convincing rotary simulation, or seasick vibrato. It utilizes a Bucket Brigade 3207 chipset to deliver the warmth of '80s-style analog chorus pedals and the designers added enough onboard and outboard control to put you in command of every aspect of the Emperor’s voice. Whether spreading its warm tones or icy sheen to a pristine-sounding stereo rig, or utilizing an external expression pedal to cop realistic rotary speaker sounds on a blues gig, the Emperor can do it all. The designers call the Emperor an analog chorus/vibrato. That’s just because calling it a true analog chorus/pitch vibrato with tap tempo/waveform selection/rotary speaker simulation/true stereo output/and more pedal would have been a pain to write every time. Making a good thing better? Yes please. The Emperor V1 had a Tone control which has now become the EQ control in the Emperor V2. JHS replaced the passive tone control in the V1 with an active EQ control that functions as a Tilt. You'll now have much more tone shaping capability in the V2. The overall EQ control is much improved in the Emperor V2 and you will not lose any low-end sometimes commonly found with chorus/vibrato pedals. When designing the Emperor, JHS conveniently and inconspicuously tucked in stereo output and the ability to select between buffered or true-bypass operation.